Camping is one of the best ways to get the whole family immersed in the great outdoors. Fortunately, it’s also an activity that can also be enjoyed by your beloved family pet. Man’s best friend was never meant to be confined to a cage or kennel, so you should definitely consider bringing your dog along for some scenic fun. There’s no need to spend exorbitant kennel fees or hassle a friend to take care of your pet all weekend when you can rough it together in the wilderness. Any healthy, well-behaved, adventurous pet is the perfect pet to bring along to the campground. However, it’s important to first invest a little bit of time and money to ensure your pet’s safety and well-being before setting out. Firstly, do a bit of research into your destination of choice to make sure pets are welcome in the campground or park. 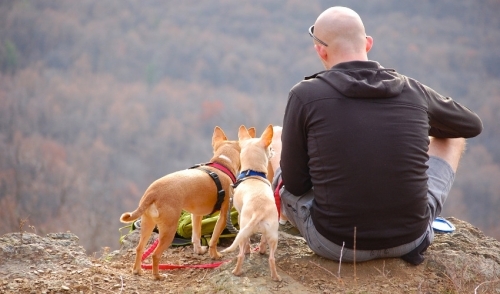 You shouldn’t have any problem locating a pet-friendly camping spot but it’s important to know about dog-trails, potable drinking water, and leash-free areas. Depending on your geographic location, you may have to take extra precaution against curious and hungry wildlife. Coyotes, bears, snakes, and a whole host of other wildlife can seriously endanger not only your dog but the rest of the family too. Make sure you’re aware of your surroundings and well educated on local wildlife threats. Furthermore, you’re going to want to make sure your pet is readily identifiable in case they stray away from camp. You can find a durable, cheap travel tag relatively easily to contain personal information in case your dog gets lost. It’s also necessary to consider your dog’s safety and comfort to make sure the vacation runs smoothly. Bring along a pet-specialized first aid kit that includes bandages, gauge, tweezers, and athletic tape. It doesn’t have to be a terribly in-depth first aid kit – just make sure you know what to do in case your pet gets injured. As an extension to the first aid kit, bring along enough grooming supplies in case your pet get’s a little too curious and wanders into some thick woods. If your dog’s coat frequently falls victim to fleas, ticks, burs, and lice, make sure you carry the proper grooming supplies to the campground. Toss a cheap rag or towel into your luggage in case your furry friend needs a wiping before it hops in the car or tent. Finally, make sure your dog has plenty of food for the duration of the trip. Some treats and toys can add plenty of positive reinforcement for a puppy or newly trained dog experiencing the great outdoors for the first time. Keep in mind that your pet’s first time camping can be a bit overwhelming. Be conscientious of your pet’s well-being and safety, and you’re guaranteed a memorable vacation.